It's just three days since the Australian Open kicked-off. Let's check out what the top stars are wearing. Certainly, tennis fashion has travelled a long way from whites to bright colours. Players and the famous brands are experimenting with various shades. Click NEXT and breeze though the outfits that caught the attention of shutterbugs at the year's first Grand Slam. The fashionable Maria Sharapova has received much flak for her dressing sense on tennis courts. This year the pin-up girl began her campaign in a pale blue tunic dress and shorts, against Bethanie Mattek-Sands of the United States. The top works well for the Russian ace’s long torso but the shorts were an unexpected choice. Over the years, World No 1 Serena Williams seems quite settled with the choice of clothes on court. At Melbourne, in her opening match against Ashleigh Barty of Australia, she played safe with V neck and broad straps and feminine skirt. The color blocking gives the already fit player even more definition. The five-time Australian Open champion comes with a lot of variation in colours like pale blue, pink and black. Defending champion Victoria Azarenka sported a printed tank, pleated skirt combination in her opening round match against Johanna Larsson of Sweden. No fuss around; the style was a pretty straightforward athletic gear. The Belarusian, despite a slight wobble, surely means business. Caroline Wozniacki opted for another Stella MacCartney outfit, yet again preferring yellow and white. Yellow perfectly matches the Australian sun, but the skirt and pattern left a lot to be desired. Ana Ivanovic nails it right at the Open when it comes to fashion on court. The Serbian beauty looked stunning in blue on the blue courts. The soft neckline and orange bra and shorts underneath was good combination. The mesh in the back, inspired by geometric pattern, makes the outfit unique and modern. Maria Kirilenko will also sport the same kit designed by Stella McCartney. Elegant pleats, played with a leopard print, gives the skirt sophisticated air. 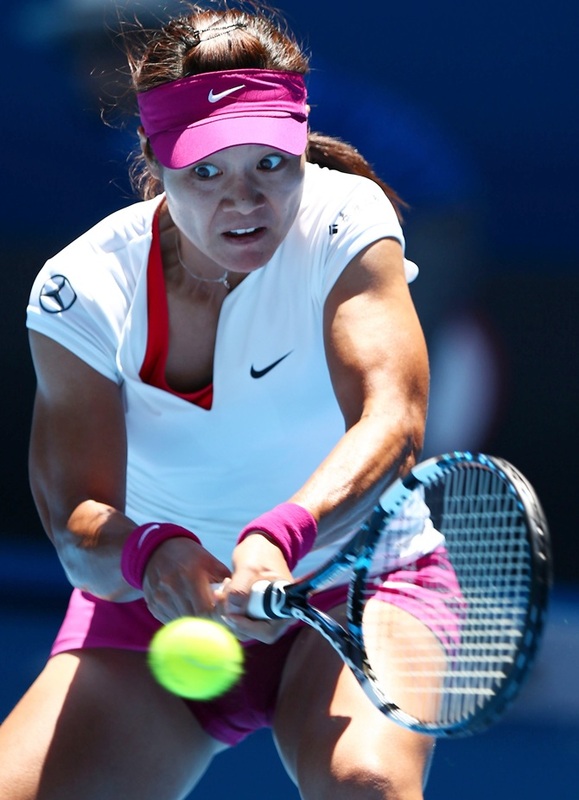 Australian Open runner-up Li Na keeps her signature V-neck cap sleeve top for this year’s run in Melbourne. The bright magenta skirt adds a heavy dash of colour. The men are not left far behind when it comes to fashion on the court. Most of them will be seen wearing shades of grey and red as they take to the iconic blue tennis courts of Melbourne Park. 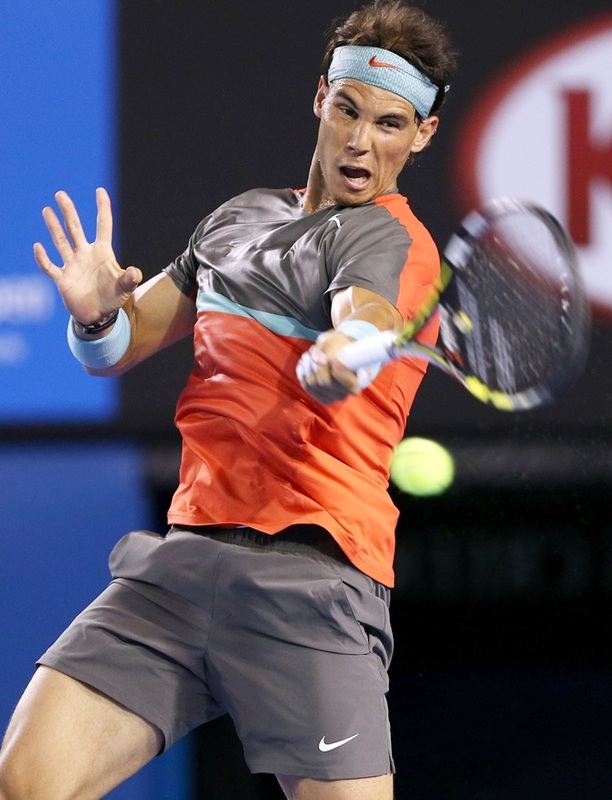 World No 1 Rafael Nadal is wearing the boldest burst of colour, with a blue stripe across the chest. Roger Federer gets more personality with a personalized kit. There's a hint of red on the collar and black on the sleeves on his premier RF T-shirt. And don't miss the shorts to beat the Melbourne heat.